The Superman Fan Podcast: Episode #385 Part IV: Superman Comic Book Cover Dated August 1965: Action Comics #327! 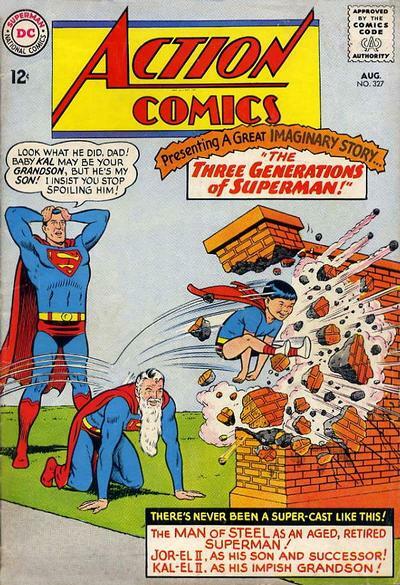 I remember "The Three Generations of Superman" (Shouldn't it have been "of SuperMEN"?) from my boyhood, and, like you, I'm a fan of Imaginary Stories, particularly ones involving Superman and his descendants, especially when there's a super kid. Given the difficulty Superman has keeping up with his super grandson, we have to admire Ma and Pa Kent all the more for raising a super son when they had no super powers, themselves. Although I do like the idea of Superman sharing a secret with his grandson at the end, I think Superman might want to let his son know about the potential for an alien invasion of Earth. I hope you will come to revise your initial "zero" rating for "Supergirl … Fugitive From Justice" after you read the next part. I think, even without knowing the ending, that's a bit harsh. After all, the story certainly makes the reader want to know more, and try to puzzle out what's "really" happening. We know that Supergirl is not a criminal, so what's going on here? I suspect that "Superman" is an imposter, and this is some scheme to get Supergirl out of the way for some reason. After all, Superman is off-planet, so she's the next line of defense. No matter what the explanation, any kid (or adult) reading this story would certainly want to read the rest of the story in the following month's issue. Thanks for your comment. I hadn't considered the possibility that Superman might have been an impostor. And I guess there's also the possibility that she was in on the plot and was being a very good actress.